These heavy duty aluminum alloy TeleScoping Poles are designed for use as telemetry antennae masts, surveillance camera mounts, lighting, or any special purpose application requiring easy access or maintenance. Mounted in a permanent base, poles can hold up to 80 lbs of equipment with low wind resistance at a height of 18-feet, up to 25 lbs at 30-feet, or up to 5 lbs at 45-feet. Collapsed to less than 108-inches, poles can be shipped via standard delivery services and easily transported to remote locations or within structures. Poles are hollow, suitable for a lightweight cable to be enclosed within pole. However, special care must be exercised to feed and retract cable during extension and collapse of pole, as any cable inside a pole is subject to entanglement and twisting. Made of drawn 6061-T6 aluminum alloy, these all metal poles and locks are extremely strong, durable and easy to use. Segments lock in place automatically with a simple twist when each segment is extended to full length. Unlock occurs by simply reversing the same motion. Poles can be made in custom lengths, heights and any number of segments in batches of (100) or more. Call for further information. Custom poles may be made in any length of segments from 3-feet to 8-feet each. Longer segments may be possible for use with lighter weight equipment. Hybrid poles with more than 3-segments are available for special applications, using lightweight 6063-T832 drawn aluminum alloy tubing for the top segments. 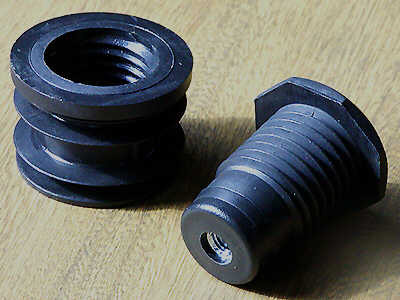 Standard base segment diameter is 3½ or 3-inches, with segments 2½-inches and 2-inches for extruded tubing, and 1½-inches and 1-inch for lightweight drawn tubing. J-Lock™ TeleScoping poles are produced in large batch orders for custom manufactured applications. A limited quantity of 18-foot J-Lock™ TeleScoping Poles and other miscellaneous sizes are available for individual orders. Poles MUST be mounted securely for any application. External pole mounts suitable to be set in concrete or solid rocky ground, are available for various types of permanent installation. Custom pole mounts for permanent structural installation can be made available by special request, cost to be determined. A base mount suitable to be set in concrete, or solid rocky ground, is available for various types of permanent installation. For equipment with a higher wind resistance, secure guy wires will be required to control lateral stresses. 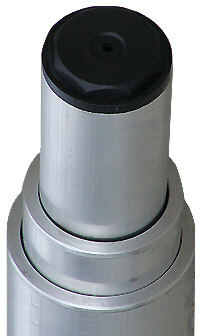 Tip end diameter for standard pole is 2.0 inches. Hybrid poles tip end diameter are 1.5 or 1.0 inches. Poles may be fit with selection of tips shown below, price varies. Poles are packaged in cardboard shipping tubes suitable for standard shipment via traditional express and ground carriers. Also available are lightweight fiberglass and aluminum poles designed for general purposes with a variety of tip-end attachments. See TeleScoping Poles. 12 ft 2 2.5-in 2.0-in 13 lbs 79 inches J-LOCK12/2 425. 18 ft 3 3.0-in 2.0-in 20 lbs 82 inches J-LOCK18/3 575. 25.5 ft 4* 3.0-in 1.5-in 22 lbs 85 inches JT-LOCK26/4* 675. 33.5 ft 5* 3.0-in 1.0-in † 24 lbs 88 inches JT-LOCK34/5* 875. 1. LIFT tube segment up until it stops. 2. Rotate segment LEFT until it LIFTS up another two inches. 3. Continue to Rotate LEFT 3/4 inch, drop down to Locked position. 1. Lift 3/4 inch and Rotate tube segment RIGHT. 2. Carefully LOWER tube segment until only 1 inch remains showing. 3. Warning: DO NOT DROP TUBE SEGMENT TO BOTTOM OF RETRACTION. This would slightly damage the interior tube segments. Damage may stop ability to easily extend and lock segments. J-Lock™ TeleScoping Poles are NOT provided via the DLA system. You must Order direct. We accept Visa/MC purchase cards and deliver direct to individual commands. GeoData is the SOLE SOURCE manufacturer and provider of these J-Lock™ TeleScoping Poles. Name J-Lock™ TeleScoping Pole is the exclusive property and trademark (™) of GeoData Systems Management Inc.
J-Lock™ TeleScoping Poles are NOT SOLD to any third party organization for Resale. "Open Bidding" for these pole/masts by any party, organization, or governmental entity is strictly prohibited. Instituting such activity, violates our rights as Sole Source Manufacturer, our contracts, and ultimately USA and international law. Pole strength and durability are untested. However, manufacturer evaluations indicate impressive resistance to pole failure with nominal loads at end. Poles are capable of being raised and lowered from horizontal to vertical while fully extended, without danger of pole failure or excessive bending. Manufactured by GeoData Systems Management, Inc. Distributor & Manufacturer assume no personnel liabilities what-so-ever in the use of these poles.